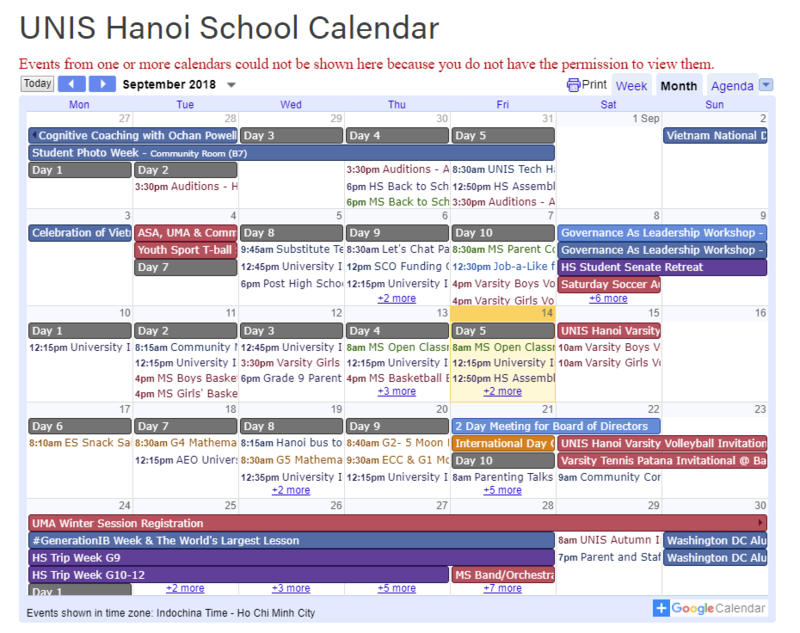 We hope that you have all synced your calendars and are keeping up to date with all the events at UNIS Hanoi. Please read the original Tin Tuc post from the start of the year article for full details. And now, a special update for Middle and High School parents! To help you keep your kids on track we have also created the MSHS 10-Day Schedule as a calendar that you can also sync and remember which day it is! Please visit our Calendar page on the website for full details and instructions for syncing calendars with all devices and calendar soft wares and the quick links to update your devices. Tuesday September 25: Grade 6 Parent Night. Wednesday, September 26: G2 Mathematics Coffee Morning with Parents. Friday September 28: Middle School Parent Coffee Morning. Please read the Tin Tuc article from Middle School for full details. Friday September 28: K2 Mathematics Coffee Morning with Parents. Saturday, September 29: Parent and Staff Sparkly Social. Please read the SCO article for details.